For centuries, lace has been a staple in fashion. It has a distinctly romantic feel and looks dainty and elegant. 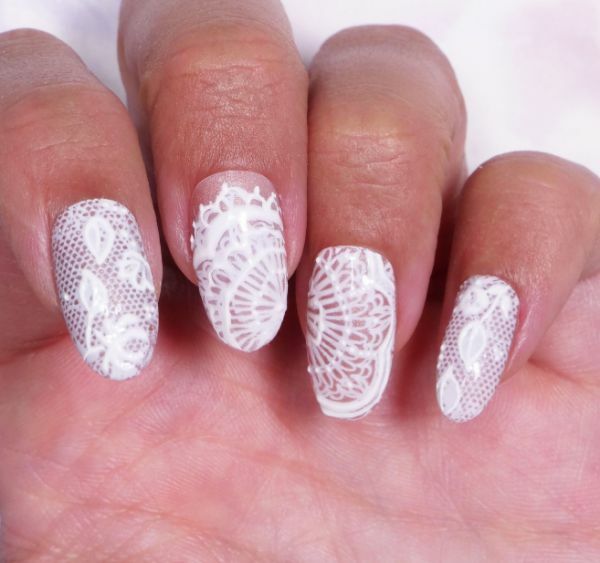 Adding a little lace to a manicure seems complex, but a nail stamping kit can make it easy to achieve. This 3D design includes a metallic background, a white stamped image and some additional detail that gives each individual design more dimension. If you’ve never tried stamping gel before, watch the video all the way through before trying this at home. The gel dries quickly, so it’s important to complete one nail at a time and to clean your stamping tools after each individual stamp. To ensure a nice finish, try this out on an accent nail. Once you get the hang of it, things will go more quickly. 1. Apply one coat of metallic gel polish to the nails, then cure them with the UV or LED lamp. 2. Apply latex tape peel off cuticle guard to the skin around the nail, and let it dry. 3. Paint a second coat of metallic gel polish on the nails, then cure them with the lamp. 4. Use a toothpick to apply white stamping gel to the edge of the stamping plate design. 5. Press the wet polish into the design by dragging the scraper from one side to the other, then press the stamp against it to pick up the polish. 6. Stamp the design on the nail, then cure the polish once more. 7. 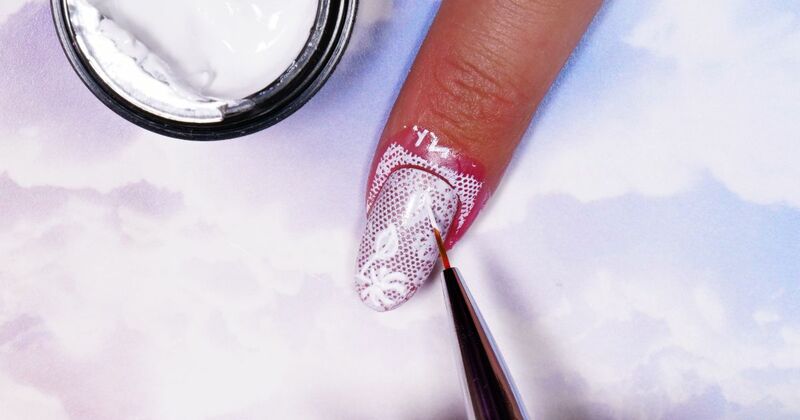 To create more dimension for any small designs within the lace, apply more stamping gel with the fine detail brush, then cure the nails with the lamp. 8. Apply gel top coat to the nails, then cure them with the lamp once more. 10. Clean the stamping plate and scraper with an acetone-soaked cotton pad. 11. Clean the stamper by pressing it against the sticky tape on a lint remover tool.